A cut in your mouth can be caused by many different things, both internal (such as biting your cheek) and external (such as a dental procedure). While many mouth cuts require minimal treatment, others are serious and require emergency care. These include direct trauma to the face, deep lacerations to the inner cheek, gums, or tongue, and related dental injuries. If you experience a cut in your mouth, the first course of action is to stop the bleeding. If the cut is relatively mild, try rinsing your mouth with a little ice water. This shrinks some of the smaller blood vessels and can help reduce swelling and pain. You can also apply a cold compress to the outside of your cheek for much of the same effect. Some people even like rolling an ice cube in their mouth until the bleeding stops and the pain recedes. Once the bleeding stops, get a tube of antibiotic cream made especially for oral sores (like Orajel). Some have numbing agents that can help ease the pain. Avoid antibiotic creams that are not intended for internal use. Speak with the pharmacist if you are unsure. To help the wound heal, some people will turn to home remedies that have antiseptic or antibacterial properties. These include clove oil, which can be applied directly to the cut, or a poultice-like paste made of water and baking soda. While Tylenol (acetaminophen) can provide short-term pain relief, avoid aspirin, which can promote bleeding. While you heal, avoid heavy brushing or flossing around the affected area, as well as alcohol-based mouthwashes, which can cause stinging. The same applies to acidic, spicy, crunchy, or excessively salty foods. If you wear braces, get some orthodontic wax from the pharmacy and apply it over any brackets or wires near the cut. This will help prevent the reopening of the wound. If you are unable to stop the bleeding or the injury is clearly severe, you need to seek the appropriate medical care. Deep lacerations and heavy bleeding should be treated at the nearest emergency room. Call 911 if you are feeling lightheaded or clammy, or have a rapid pulse and respiration. Dental emergencies should be treated at a dental clinic. In an emergency room situation, priority will be placed on stopping the immediate bleeding. In some cases, stitches may be used. The stitches may either be dissolvable or will need to be removed in five days or so. You will typically be given an oral antibiotic and a mild painkiller to aid in your recovery. If the laceration is deep, the doctor may order an X-ray or CT scan to establish the nature and extent of the injury. If you were given a blood transfusion or experience any signs of shock, you may be kept in the hospital overnight for observation. If serious tooth damage also occurred, you will be referred to a dental surgeon for an appointment at a later date. Be sure to ask the hospital staff for a copy of the X-rays to take with you. If a tooth is chipped, save any broken bits so that you can take them with you to the dentist as soon as possible. Follow the home care tips above if there is any bleeding. If a tooth is partially dislodged, focus on controlling the bleeding first. You should then rush to the dentist as soon as possible to seek treatment. This may involve dental splinting, the repair of the socket, or the replacement of the tooth. If a dental crown falls off or a bridge is broken, see your dentist as soon as possible. While you are waiting, replace the crown if you can with some denture glue or an over-the-counter dental cement. Do not use household glue. If a tooth is knocked out, hold the tooth by the crown (the exposed part above the gum) and rinse off the root if it is dirty. Do not scrub the tooth or remove excess tissue. If possible, reinsert the tooth into the socket. If it is not, gently stuff some gauze into the tooth gap to stave the bleeding, place the tooth in a container of milk, and rush to the dentist's office. Knocked-out teeth have the greatest chance of being saved if reinserted within an hour of the injury. Depending on the procedure used, the dentist may prescribe oral antibiotics and nonsteroidal anti-inflammatory drugs (NSAIDs) like Advil (ibuprofen) or Aleve (naproxen) to aid in the recovery. If dental stitches are used, you would be asked to avoid smoking, alcohol, or sipping through a straw while you heal. In addition to eating soft foods, you will need to follow strict instructions on how to care for your surgical dressings. Even though dental sutures typically dissolve on their own, you will still need to follow up with the dentist to assess how the wound is healing. 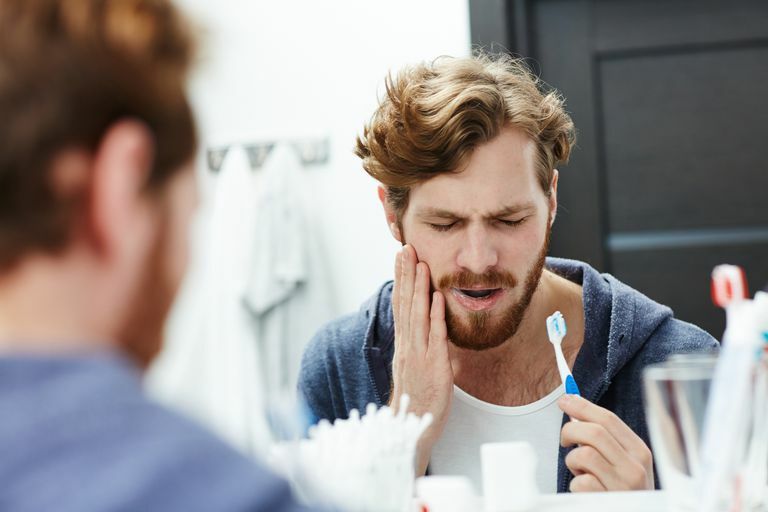 Even if you are able to stop the bleeding from a mouth injury, it is still a good idea to see a dentist if the cut is deep or the pain is making it difficult to eat or sleep. However, if you experience fever, chills, swelling, redness, swollen lymph nodes, or abnormal drainage of the wound, see your dentist as a matter of urgency. You may have developed an infection in need of immediate care. Bakland, L. Dental Trauma Guidelines. J Endodonics. 2013:39(3):S6-S8. DOI: 10.1016/j.joen.2012.10.021. Steele SK. “Controlling Gingival Bleeding With Tea Bags.” Oncol Nurs Forum. 1992 May;19(4):663.